It has been requested that additional images be uploaded for this article. Remove this only when the image(s) have been uploaded for this article. Specifics: The remake. Mysterious Mine Carts, also known as Mysterious Carts, is a minigame in Mario & Luigi: Superstar Saga. It is located in a cave on Hoohoo Mountain along the path that leads down the mountain. The game is run by an old Beanish man. 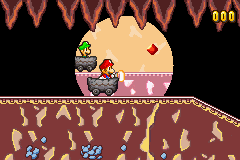 In this minigame, Mario and Luigi must collect diamonds while riding mine carts along a set of tracks. They can get their carts to jump by pressing and , respectively. The entire portion of Mario's track is visible to the player; however, only a small portion of Luigi's is, which is lit up by a flashlight held by Mario. This light can be moved using the . In addition to collecting diamonds, Mario and Luigi must avoid falling stalactites that resemble Thwomps. The battery of Mario's flashlight gradually weakens, and must be replaced by ones found on the track. Mario and Luigi are required to complete this minigame (by collecting ten diamonds) during their first trip down Hoohoo Mountain in order to gain access to the rest of the Beanbean Kingdom. After this, the minigame is available with added difficulty for the chance to earn Hee Beans, with the number of diamonds needed increasing each time. At certain points during every level, starting with level two, bats start to appear, though they can be scared off with the flashlight. On level five, a Boo wearing a mining helmet and holding a pickaxe may appear. Like the bats, it can be scared off with the flashlight. In Mario & Luigi: Superstar Saga + Bowser's Minions, it is required to collect 25 diamonds to beat level three, while it is only required to collect 20 diamonds to beat level four. Boos no longer wear mining gear, and first appear in level three. The music used for this minigame, as well as the cave areas themselves, is an arrangement of the underground theme from Super Mario Bros.
↑ Stratton, Stephen, and Levi Buchanan. Mario & Luigi: Superstar Saga Prima Official Strategy Guide. Page 22. This page was last edited on November 14, 2018, at 17:02.